i b i k e l o n d o n: Cyclists hate road narrowing schemes, but have our cycling campaigns been asking for them all along? Cyclists hate road narrowing schemes, but have our cycling campaigns been asking for them all along? I was in Birmingham recently for the excellent Cycle City Expo where hundreds of cycling campaigners, road engineers, and local councils came together to think about really getting Britain cycling. There was a palpable atmosphere that the new age of the bicycle was well on its way, and indeed that "something" will need to be done on our streets to help accommodate it. But just what should be done is still very much up for debate, and this was brought home to me by a conversation I had with an engineer there who was exasperated with cycling campaigns. "You cyclists don't know what you want!" the engineer exclaimed. His outburst came as a shock to me. I'd been telling him about the latest design trend for road narrowing schemes that is sweeping our capital. I'd told him that such a design had been built on the Bethnal Green Road and provoked an incredible reaction from people who ride the road everyday, and that in Westminster plans to narrow the carriageway on Haymarket had people who ride there up in arms. I explained my view that road narrowing puts people on bikes at a disadvantage, cutting their ability to get ahead of stationary traffic, bringing them closer together with heavy moving traffic and leading to dangerous overtakes by drivers who don't realise that cyclists are supposed to take the lane, or worse, just grow reckless and impatient. I told him that I thought plenty of cyclists hated such schemes and would do anything they could to avoid any such future projects being implemented on busy roads and key cycle corridors. Many people have told me they feel intimidated and bullied by motorised traffic when they are brought closer together by road narrowing, and recounted horror stories of road aggression, near misses and uncomfortably close passes. That's when the engineer started to sigh, scratch his head, and look at me in an exasperated way. Road narrowing on London's Strand. No room for error here. "Don't you see?" he began to explain, "Cyclists have been asking for road narrowing schemes for years. And now they are being built, you are telling me that cyclists hate them. You cyclists don't know what you want!" "I've worked on a road narrowing scheme before. The client, the Council, wanted to turn an A-road in to a more people friendly street, most particularly with regards to accommodating all of the cyclists, who in recent years had become the majority of the traffic on this particular stretch. The road is also a bus corridor, and busy with lots of pedestrians. A shopping centre had been built on the road recently and there was a big pot of Section 106 money set aside for streetscape improvements. There was enough space to build really good cycle tracks, and increase the width of the pavements for pedestrians, as well as to accommodate pull-ins for the buses and loading bays for the shops. At first I thought that would be the best option to build; something for everyone. But the local cycling campaigners disagreed." My heart sank at the words "local cycle campaigners"; whilst I know there are hundreds of highly committed individuals up and down the country doing outstanding work, sadly amongst their number there is still a highly vocal minority wedded to some very strange ideologies regarding how best to provide for cyclists. "The local cycling campaign drew our attention to the Hierarchy of Provision. It's a Department for Transport standard, you must have heard of it?" quizzed the engineer. Indeed, I had. The "Hierarchy of Provision" can be found in the DfT's briefing LTN 2/08 Cycle Infrastructure Design [PDF] It is also the foundation guide for all of the CTC's approach to campaigning and the basis of their recent design brief Cycle-friendly design and planning [PDF]. In a nutshell, it tells urban designers and road engineers what they should do when considering the place of cyclists and supposedly cycle-friendly measures. It says that Dutch-style infrastructure should be considered as a 'last resort' after traffic reduction, traffic calming and speed reduction, junction treatments and painted bicycle lanes or shared bus lanes. Everyone knows that overt traffic reduction is a politically impossible request, so the first practical suggestion on the list of considerations is speed reduction and traffic management. "Don't you see?" said the engineer, "The local cycling campaign showed us the Hierarchy of Provision and made it perfectly clear that even though there was space for really good quality cycle tracks where our scheme was being constructed, they didn't want them. They pointed to the DfT's guidance and, well, frankly it isn't the place of a road engineer to take on the might of the Department! They showed us that cycle tracks weren't wanted, necessary or welcome. In fact, one or two of them had some funny ideas about cycle tracks being an invitation for trouble and danger, and the last thing I want is some kind of liability issue arising out of my work. So I followed the guidelines and did what it asked; we narrowed the carriageway as much as we possible could. It slowed the traffic down - down from about 40mph on average to about 25mph today. It also meant there was room to put in a few extra trees and benches and bike stands, which is great, obviously. We reduced the speed, and managed the traffic, just as the cycling campaigners had asked us too." At this point the engineer's face grew dark. He even looked angry. Downing the last of his coffee he pointed at me and said again "Cyclists don't know what they want!" "We did what the campaigners asked. We did what the guidance from the DfT asked, which I understand was written with input from the CTC. We reduced traffic speed. We put in place a system that managed traffic. We didn't leave room for reckless driving"
"But it's been terrible. The Council are furious with us! Firstly, the volume of cycle traffic on the route dropped off by about a third. You have to remember that cyclists used to be the majority of traffic here; that's a big deal. Worse still, the instances of pavement cycling have shot up. The local Police had non-stop complaints from shop keepers and local residents about people cycling on the footway during the rush hour because the traffic is at a standstill and cyclists can't get through on the narrowed road. I admit it, what's the point of riding a bike if you can't go faster than all of the stationary traffic stuck in jams?!" 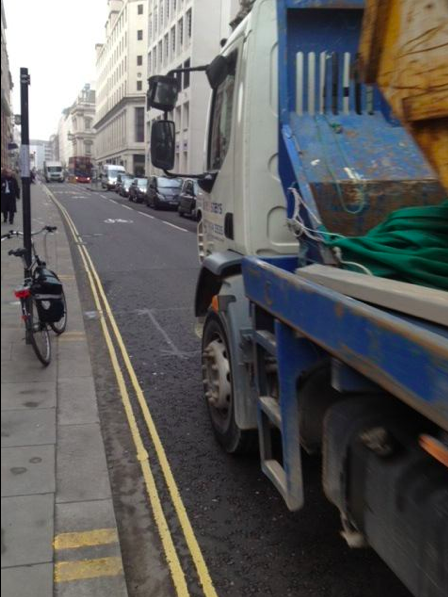 A skip lorry overtakes a cyclist on the narrowed Cheapside in the City of London. Picture courtesy of Cyclists in the City of London. "Then, last month there were two terrible accidents on the road. It turns out that in order to skip the stationary traffic, but avoiding cycling on the pavement, some people on push bikes have been riding down the outside edge of the lane - that is to say they've been riding down the middle of the whole road - like a motorcyclist would. Someone on a bike got hit head-on by a motorbike coming the other way. It was a really nasty crash." "Then the other crash was when a driver tried to over take a cyclist in the middle of the lane whilst the traffic was moving. Technically the cyclist was doing the right thing, but the driver, either through ignorance, or impatience, or both, tried to overtake. Our design was supposed to "discourage" over taking, but it hasn't worked. The driver went for it, misjudged the distances and crashed in to a pedestrian refuge in the middle of the road. It could have been very serious." I suddenly felt sorry for the engineer. Designing a street on which cyclists, buses, lorries, pedestrians and cars have to interact is a huge responsibility, and the individual obviously took the consequences of his work very seriously indeed. He continued; "After the crashes, and with all the pavement cycling going on, we went down there to actually talk to the road users to try and find out where our design was going wrong. We spoke to some taxi drivers who said they hated the road now; they had no idea that cyclists were supposed to ride in the middle of the road and said they always felt unfairly held up when the traffic was moving. We also spoke to some of the cyclists and every single one of them really hated it. They told us that our new design made them feel in more danger than before, and that they didn't want to have to ride their bikes as though they were cars. They felt that there was no room for mistakes on the narrowed road, and most of them admitted to skipping on to the pavement when the traffic came to a standstill, of it they felt they were riding too close to big vehicles likes trucks and buses. I asked them all, if they had a choice between narrow slow roads, or less narrow roads with cycle tracks, which would they choose. Nearly all of them chose cycle tracks; the very thing we had not built. So you see my point now; cyclists, and their representatives, don't know what they want!" I couldn't quite believe what I was hearing; cycling design guidance had been used to create the very last thing that any normal cyclist would want. Whilst I think the creation of the Hierarchy of Provision came from a well-meaning place, the episode over coffee with a design practitioner showed me that in reality it simply isn't fit for purpose. Except for some stringent vehicular cyclists, I am yet to meet a single cyclist who thinks that road narrowing schemes on major roads (like the Bethnal Green Road) are a good idea. That the very guidelines which have been drawn up to supposedly protect people on bikes are now being used as an excuse to create conditions which actually threaten them is perverse in the extreme. The Hierarchy of Provision fails because it tries to be a "one size fits all" fix for all roads, regardless of what the primary use of those roads might be, and because it is far too open to interpretation. Road narrowing (and shared space) could be a useful tool available to us in our quest to create a more liveable city, but only when used in the right context. On primary transport corridors which throng and heave with cyclists as well as buses, trucks and cars, it is clearly an unmitigated disaster. It is no good suggesting a series of measures to help cyclists without first considering what the street it is being applied to is being used for. The Hierarchy seems to me to be a document from another age; a less-cycled, less knowledgeable age. Dare I say a pre-internet age where we weren't able to see, and understand, the other options available to us just over the North Sea in more successful cycling countries. The Hierarchy of Provision is like Communism; perfectly well-meaning on paper, but a disaster in reality. When interpreted in to the real world it equals a harrowing experience on our streets. That an engineer waved a copy in front of me as being the basis for introducing a dangerous and uncomfortable road narrowing scheme just goes to show how far those interpretations can go, and how entirely unfit for purpose our cycling design guidelines are. There may be one or two campaigners in our midst who very much like the idea of bicycles behaving as vehicles and taking their "rightful place in the road", but as road narrowing schemes demonstrate when it comes to actual everyday and ordinary cyclists using these designs, the reality does not live up to the rhetoric. The alternative solutions are well-documented and already exist, it is time for our cycling campaigns to go back to the drawing board together and start again with our cycling design guidelines, before every other road in our city is narrowed. In brief, cyclists must decide what they want. For more excellent and in-depth analysis of problems with the Hierarchy of Provision, see As Easy As Riding a Bike, Vole O'Speed and War On the Motorist blogs. I thought I recognised the scenario you were describing with the lane narrowing – it had all the features of one not far from where I work – until the very end where I could see that in fact it is another example. I am sure there are plenty of others too. I can sympathise with the engineer’s frustration but I would like to think that this apparent schizophrenia will be a temporary transition, from local authority engagement with the usual suspects, the old guard, to engagement with a resurgent – or should that just be surgent – movement of campaigners looking for something which works for everyone, and not just the elite few who basically want to be able to hammer around the streets at near motor speeds, but without being pureed by the next HGV to turn left in front of them. Finally, I suspect that engineers will run up against policy-based evidence-making, so to speak, in that the hierarchy of provision approach to cycle facilities also happens to be dirt cheap – and the local council would surely prefer to spend what cash it has available building a new bypass to “ease congestion” – at least as far as the next bottleneck down the road. The siren voices of the Franklin tendency will therefore continue to be heard, and the man’s entirely undeserved reputation as an “expert” will continue to be honoured, unless new wave campaigners shout louder. Thanks Paul, the scheme referred to in this article is not the one you are thinking of, but it might as well be - the shocking side effects of carriageway narrowing seem to be the same wherever it happens, be that Cheapside or Hornchurch. I too hope that we are in a transitionary period whereby messages and priorities are somewhat confused as cycling, and cycling campaigns, get all of their ducks in to line. Indeed, I have been greatly encouraged by the fine words in the Mayor's London Cycling Strategy and the bold experiments taking place at the TRL test sites. I hope that they are a sign of better things to come, and as you say those of us who blow the trumpets and wave the flags will have to continue to do so fervently! As to the Engineer being disingenuous, I'm inclined to agree, though I know that most urban planners, engineers etc will just design what they are asked to by the client, using whatever guidelines they currently have to hand. That's why it is so essential we move from the far too simplistic and clearly damaging HoP and come up with some proper national design guidelines. There is a very simple rule for all road designers: Anyone aged 11 and over is legally required to cycle on the road, not the pavement. Look at your design and decide if an 11 child could safely ride along it. If no, then put in the cycle lanes. Otherwise we will never get more children cycling to school. @Aniello The local cycling campaigners could well have been the local branches of either the LCC or the CTC if outside London as they operate on a devolved basis. Therefore, the answer the engineer might have received depends on the thinking of he local campaigner. All the more reason to have strong and binding guidelines that aren't open to such wide misinterpretation, I think! The Hierarchy of Provision isn't the only guide on provision within LTN 2/08. There is also Table 1.3 "Approximate guide to type of provision" (page 13 of my copy). Using your example, road width reduction has reduced the average speed from 40 mph to 25 mph, you don't state the number of vehicle movements so we can't plug it into the table but you do say it is congested & Note 6 states "In congested areas cycle lanes can be useful even when traffic speeds/flows are low." I'm not defending LTN 2/08 as an amazing document but it is a bit much that cyclists get blamed for not knowing what they want, when the engineer isn't even designing to the low bar set by it. I think some of the problem is a flawed reading of the 'hierarchy of provision' table, for the things which it does cover. I don't know why everyone has such an issue with The Hierachy of Provision, yes the order isn't great but it isn't the source of all evil, just generally poorly written/interpretted. Take the road in the example, it's an A road and as the engineer says " Everyone knows that overt traffic reduction is a politically impossible request" so traffic reduction is out, but there is no reason why traffic reduction can't consist of stopping this being a through road. That is a very Dutch solution. 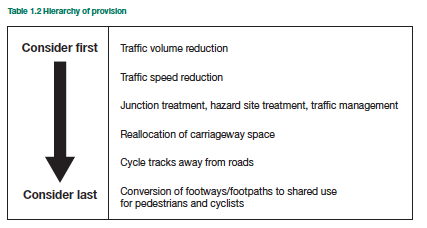 Speed reduction - the average speed has been reduced to 25mph, I guess then that the speed limit is 30mph, that is still too fast for cyclists, reducing the speed to 20/15/10mph would be a lot more suitable for cyclists, but again this is an A road so that would be unacceptable. Junction treatment etc- if they're the only problems, and the route is acceptable otherwise, then fine just sort out the junctions, but again this is an A road so just 'managing' the traffic isn't going to result in an acceptable route. OTOH there's no reason why junction treatment can't include cycle lanes that allow cyclists to bypass the queuing traffic. So basically you're on to reallocating road space/cycle lanes, unless there really is no room, in which case the very last option should be shared use, which I'm not really in favour of unless you interpret it as closing off the road to motor traffic completely. So in my opinion the problem in this situation wasn't the Hierachy of Provision, it was that it wasn't implemented correctly/used as an excuse. Traffic wasn't reduced enough in either volume or speed, traffic was managed incorrectly, junction treatment is obviously poor/non existent and road space was essentially de-allocated from cyclists. On a main road you should always be going straight down to cycle lane/path, you're never going to reduce traffic volume / speed enough while keeping it a main route, the first two options can only really be considered on smaller roads. I would be in favour of fighting for something better than the Hierachy of Provision, but surely it would be easier just to turn around to every engineer/politician/civil servant that claims "but we followed the Hierachy of Provision" and reply "yes, in the same way that Google follows tax laws". The last people we should be designing for is the seasoned and long-running vehicular cycling campaigner (yes I am looking at you CTC). The meetings I have sat in where "cycling representatives" cannot even agree amongst themselves. DfT guidance is pretty poor, TfL's not much better, but engineers cling to guidance almost as a get out of jail free card - read my blog on risk and liability - unless an engineer is massively negligent, he/she will never be sued. Adam is right, we need to design for kids about to go out on their own, or with a little adult supervision. Vehicular cycling has had its day in my view. Hmmm, I know have an idea for a blog! I'm curious that this engineer claims intially to have proposed a scheme with separated cycle tracks. If the 'hierarchy of provision' really is DfT guidance, then surely the engineer would have referred to that guidance at the very start? Why go against an accepted (if flawed) standard unless there were very good reasons for doing so? What research did this engineer's team do to come up with the 'segregated' design? Did they not research any exisitng road narrowing schemes? If so, why did they then throw out a potentially good proposal for the flawed one that has been such a manifest failure? These are rhetorical questions of course, but I would bet that if an engineer designed a road scheme that put motorists in much greater danger, they would be out of a job pretty quickly. I don't understand why doing the same to cyclists should be considered acceptable. @Adam: actually since a bicycle is a "carriage" in law, anyone riding a bicycle must ride in the "carriageway" and not on the "footway". This legal definition comes from the late 1800's when bicycles and other carriages travelled at a similar speed, and before cars were invented, let alone common on our roads. There is no age limit involved: any child riding a bicycle on the footway is committing a criminal offence. The only age-related issue is that children under the age of 10 can't be arrested or charged for the crime: but they could be given a child curfew, a child safety order, or their parents could be held liable. Luckily the police can, and do, turn a blind eye to this rampant criminality. Of course if we had Dutch-style safe motor-traffic-free cycle tracks and routes there wouldn't be this issue at all. Motor vehicles, cyclists and pedestrians would each have their own space to move around safely in. 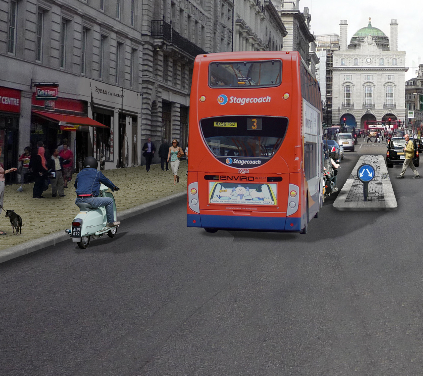 The London Cycling Campaign has been vocal in condemning Westminster's plans for the Haymarket area, and have publicised an alternative proposal using high-quality cycle tracks. No-one on a bike should be expected to fight for space on a road full of fast-moving cars, motorbikes, taxis and coaches. We and other campaigners also met with Martin Low from Westminster Council and walked along Haymarket with him to explain exactly why the plans won't benefit cycling (or walking or driving either). I believe a similar situation is developing now with the Dutch style roundabout being trialled at TRL. In my opinion, in the UK, this type of roundabout would cause conflict and hostility towards cyclists. I have similar views on cycle tracks behind bus stops. Phew! So many comments! I'll try to deal with them in order of appearence. @jrg I think you are right, it is the way the HoP is read and interpreted that makes a lot of these problems. One of the reasons I would dearly love to see the UK's cycling design guidelines re-visited is because as they currently stand they are so open to (mis)interpretation and do not consider the roads on a case by case basis for which they are supposed to be the solution. @Anonymous1 I like your Google quip! However, just because the HoP is being misinterpreted does not mean we should just accept poor road design as a fait accomplis. I am sure that better could be achieved with better design guidelines. @RantyHighwayman Looking forward to that new blog post of yours! It's controversial, but the idea that perhaps the people we should listen to are those who don't cycle but would like to, instead of those who are so committed that they do it in spite of current conditions seems to be gaining traction. A mass going back to the drawing board wouldn't hurt, I think. @Fonant Thanks for the history lesson! @MikeLCC I'm VERY pleased to see the LCC take an active stance against this scheme proposed for Haymarket - leading the way for cycling campaigns as has become usual! @Geoff We will have to see what happens with the Dutch roundabout - I've used ones in the Netherlands and they've been great (both as a driver and a cyclist) and I don't really foresee any major problems with the current design proposed for Lambeth; the people of the UK are remarkably resilient and get used to change quickly. I certainly don't think we can write it off before it has been tried. @Don I thought your comment deserved a response in itself. At first I too was surprised at the engineer and his seemingly thin lack of knowledge. Then I thought about it some more and realised that, generally speaking, a road engineer in a large firm is not going to be aware of every design standard out there. One week they'll be working on new streets for housing developments, the next on a roundabout somewhere, the week after that on some dropped kerbs in some town; essentially they are jacks of all trades, drawing up designs for clients to their brief and their deadlines. You only have to see the work that has been done on the Bethnal Green Road to see that there are people out there designing our roads who are barely aware of existing design standards and have done little or no research in to existing successful designs. In short, there is a design knowledge skills deficit when it comes to designing for cyclists, and we shouldn't be surprised. This is how engineers end up being easily led by interest groups and lobbyists, some of whom may not want what other cyclists want. @MrHappyCyclists thanks for sharing your video, I think the design floors on that cycle track are indicative of the same problem as discussed above; namely that design standards are so poor, wooly and difficult to really pin down that any old tosh gets built as the engineer sees fit. Your video just goes to show why it is really important that standards and guidelines are revised and improved. That said, I didn't think that the off road path you video'd was the worse that I have seen. As Ben Brown indicates in his comment above, some people would be happier with that kind of facility (even if it can be improved by getting rid of the bollards and verifying junction treatments) Not everyone is happy on the main carriageway. Different strokes for different boats, perhaps? This doesn't do much for my opinion of road traffic engineers. Why just do what a self-selected group of locals ask you to do and then hide behind them? What is all that professional training for then? Just let randomly chosen 'locals' come up with any cockeyed scheme they want (like the car Homer Simpson designed in an episode of the Simpsons!). Why not, instead, actually employ some professional skill and think about how things work in practice, and do some proper statistically-meaningful research into what people want? It does seem to me that in general road traffic engineers don't think about things enough before trying them, still less do they do any research on how various designs actually work in practice. Too much of road design seems to be about following fashion and responding to random lobbying. Truly a farcility to be proud of. Lea Bridge Road - cycle track poor before the bollards, but I am willing to bet they were put in to stop large vehicles parking on the footway over the bridge which I reckon is weak in bridge engineering terms - common all over London! I will leave the debate for highway engineers for my next post! @ibikelondon I am not at all happy on the main carriageway. I just think that the new shared path is even worse. The result is that they have failed me and the other cyclists that use (and wish to use) that route to get to work. That includes the lady I spoke to at the end, who is a much slower cyclist than me (and I'm not particularly fast). Also, the design is inconsistent. If it is for timid cyclists who would not like to use the road, then why does it dump them straight into a mini-roundabout at the end? It doesn't require a design manual for someone who claims to be a professional designer to see the stupidity of much of that design. To say that it's because the poor designer didn't have the right guidance is a cop out. @anonymous Perhaps the bollards are there just in case some poor fool is actually to use the lane for cycling on! It is a bit of a jump to go from "reducing traffic speeds" to narrowing lanes quite apart from quoting the HOP but ruling out the HOP's preferred option. 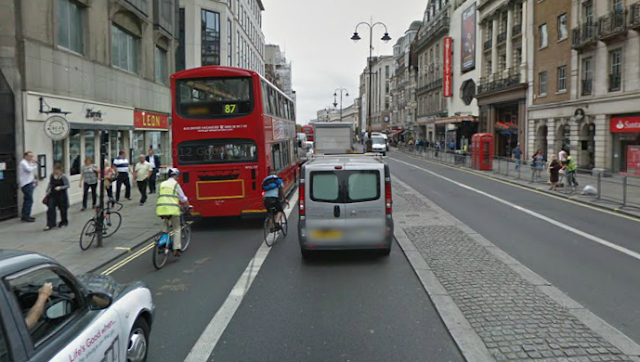 It would be interesting to see how the original cycle lane design dealt with junction. Thank You for above information about Danmark and Danmark is the beutifull country and i have some information for share about Denmark Green Card. Global Migrate is the leading consultant company which provide best information about Green Card. IOB Internet Banking by iob bank.